Dublin has the dubious distinction of being one of the few capital cities in the European Union without a rail link to its main airport. To overcome this the Irish Governement had planned to construct a new underground train link called the Metro North Project. But as a result of the recession, and banking crisis, the Irish Government has had to introduce a series of cut backs. These cut backs have fallen heaviest on capital works projects as spending cuts in these are less politically sensitive. The first casualties were the two planned underground train lines for Dublin City; the Metro North Project and the DART underground. 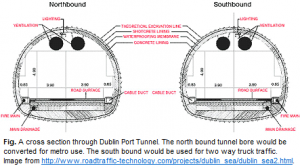 A potential alternative to Metro North would be to create the underground train link, from Dublin City Center to Dublin Airport, by using one of the two existing tunnel bores of the Dublin Port Tunnel. 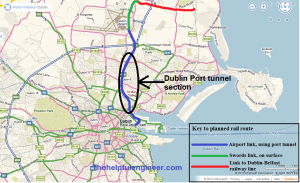 The Dublin Port Tunnel was constructed primarily for heavy goods vehicles accessing Dublin Port. Private car traffic use is minimised by heavy tolls, as a result the tunnel is relatively traffic free and has excess capacity. This alternative route would provide similar benefits, at a fraction of the cost, by using existing infrastructure. 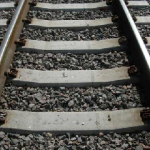 The route would make use of the underused surface rail lines to the north of the Point Depot area. 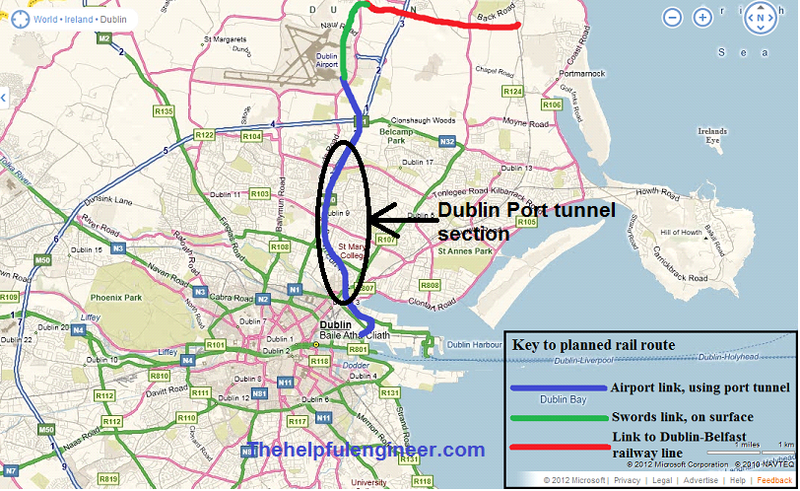 These existing railway lines would need to be extended into the north bound bore of the Dublin Port Tunnel. This tunnel bore would need to be closed to vehicle traffic and fitted with twin rail tracks. The adjacent eastern tunnel bore would have to be retrofitted to allow safe passage for two way traffic for heavy goods vehicles using a central barrier to prevent traffic conflicts. The rail line would then be routed through the tunnel and continue, on the surface, to the airport and then northwards, beyond the airport to the large commuter town of Swords. Finally it could than be turned eastwards to terminate at, and connect with, the Dublin to Belfast train line. This final section would have the added benifit of allowing Dublin to Belfast rail passengers the option of using Dublin airport without having to travel to the City Centre first. Route map for alternative to Metro North. My markup on top of an image from Google Earth. 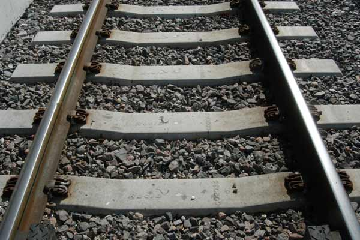 The twin track rail line will have a total length of 19km, 2 km of which is existing track, 5 km will be new track laid in the existing Dublin Port Tunnel and the reminder will be new track laid on the surface between the port tunnel, Swords and the Dublin to Belfast train line. See map above. The Dublin Port Tunnels each have a dimensional width of approx 10m. 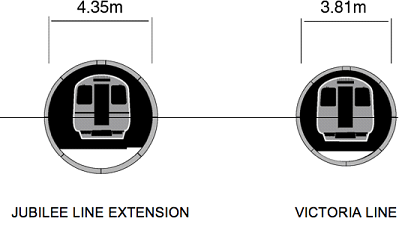 This width would seem to be adequate space for a twin metro line when compared with 4.35m and 3.81m tunnel widths for other famous single lines in London (single line widths). While this above proposal is unlikely to be considered ‘by the powers that be’, we should be considering all alternative ways to reduce the cost of infrastructure to match our available funds. It is worth building even low cost big pieces of infrastructural now when keen prices are available from large contractors. Port Tunnel is a white elephant. The thing about the trucks was the reason we were told it was built, but the main reason was to drive up property prices in the docklands. I thought a couple of years ago about turning one of the bores into a rail tunnel. Possibly it could be turned into a metro line. Would it be easy to add stations… you’d have to dig down to the tunnel and add in a station. A single-bore Port Tunnel would be fairly unsafe. There would be no easy way to turn back traffic and building the stations would be complex. The stations would end up serving a lot of the same areas of the city that are already served by DART. The service would have no fast access to the city centre, which is where the holdups really are. There are other interesting aspects to this plan for sure. You could run a vastly enhanced Airport link service, if it were well organized, via the Port Tunnel and the QBC on North Wall Quay. Also, you could build a Metro using a simplified version of the technique used for the TBM sections of the Port Tunnel. A single bore around the size of the Port Tunnel bore will hold two trains and two platforms. This vastly simplifies construction. This is the way the Barcelona Line 9 is built. A single tunnel for traffic is less safe, but the hazards can be reduced. It done through out the world already. I love the details of metro in Barcelona, thanks. It seems to be a cost effective solution having two train routes above one another in the same tunnel bore. Always wondered why nobody was struck by the notion of running a third bore for a rail line to the airport when we were building the stupid tunnel, given we have been talking about a metro in Dublin since the 60s. True. It could have followed the port tunnel towards the city from the airport and then diverged around Fairview to continue on its own to the city centre. A wasted opportunity.